Synthetic peptide conjugated to KLH derived from within residues 1200 - 1300 of Human VEGF Receptor 2. This product gave a positive signal in HUVEC whole cell lysate. Our Abpromise guarantee covers the use of ab39256 in the following tested applications. WB Use a concentration of 1 µg/ml. Detects a band of approximately 220 kDa (predicted molecular weight: 152 kDa).Can be blocked with Human VEGF Receptor 2 peptide (ab39255). Additional bands at: 31 kDa. We are unsure as to the identity of these extra bands. Immunohistochemistry (Formalin/PFA-fixed paraffin-embedded sections) - Anti-VEGF Receptor 2 antibody (ab39256)This image is courtesy of an Abreview submitted by Antibody Solutions Ltd.
ab39256 staining VEGF Receptor 2 in Human breast carcinoma tissue sections by IHC-P (Formaldehyde-fixed, paraffin-embedded sections). Tissue was fixed with formaldehyde and blocked with 5 minutes of peroxidase block followed by 10 minutes of protein block at 20°C; antigen retrieval was heat mediated in retrieval solution. Samples were incubated with primary antibody (1/250 in antibody diluent) for 45 minutes at 20°C. An undiluted HRP-conjugated polymer goat anti-mouse/rabbit IgG polyclonal polymer was used as secondary antibody. ab39256 staining VEGF Receptor 2 in rat heart tissue section by Immunohistochemistry (PFA perfusion fixed frozen sections). Tissue underwent fixation with 4% PFA and it was later postfixed overnight in the same fixative. It was then cryoprotected in 30% sucrose and cut using a cryostat. The primary antibody was diluted 1/100 and incubated with sample for 18 hours at 20°C in PBS + 0.3 % Triton X100. 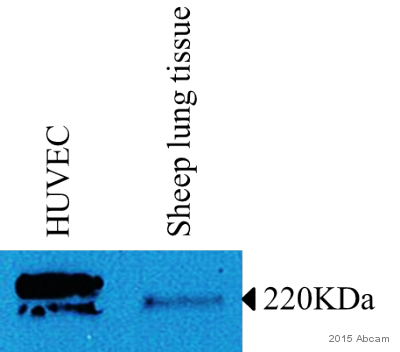 An Alexa Fluor® 488 - conjugated goat polyclonal to rabbit IgG was used at dilution at 1/1000 as secondary antibody. Publishing research using ab39256? Please let us know so that we can cite the reference in this datasheet. Please see the below reply against each query in Blue Color on this complaint as desired by you. The pictures of the controls in which the antibodies have not worked will be sent to you soon upon its receipt from this customer. Looking forward to your valued response/ comments on it. According to our records, ab39256, ab63319, ab77258, ab86673, ab103674 was proving difficult to use in [APPL] and we were in contact in order to help resolve the issue. The pictures of the controls in which the antibodies have not workedwill be sent to you soon upon its receipt from this customer. We will look forward to receive the images. On the optimization note we strongly recommend to include the blocking step in protocol; please try 5%BSA or 5-10% normal serum for 1-2 hours at room temperature with species same as secondary antibody. I am sure this step would improve the staining with ab103674 and ab39256. I may be that the tissue sections you are using does not express the targets GCET1, ERG, CD14 or express at very low level so could you provide the details tissue type and species of tissue section tested. We are interested in knowing e.g. human brain tissue sections or house heart tissue sections etc. I would suggest trying range of incubation with microwave e.g. for 5, 10, 15 and 20 minutes. This range would help to get the optimized incubation at which the antigen is maximum exposed. I hope these suggestions would be helpful. Should you have any further question please do not hesitate to contact us. Please find below a complaint from one of our customerto whom we suppliedthese Abcam antibodies. The technical formis alsoattached in this mail. Request you to kindly look into it & adviseus accordingly todo further needful on it. Looking forward towards your valued reply/ comments on it. - I am very surprised that 5 antibodies failed in row? Could you please specify which other antibody worked? - What is the type and species of tissue used with each antibody? 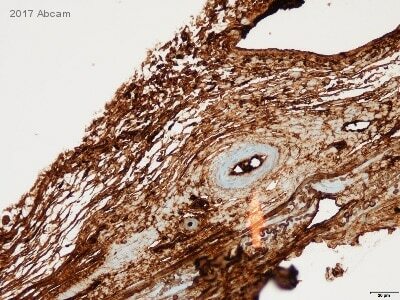 Could you supply staining images? - Are the tissues paraffin fixed as mentioned in the details or paraformaldehyde fixed and paraffin embedded sections? - What was the pH of Tris and Citrate buffer? 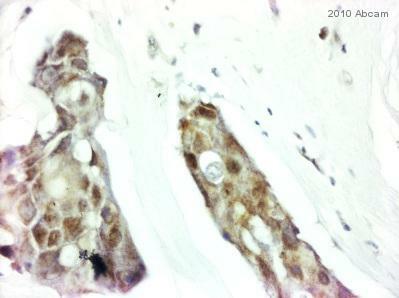 - Did tyou permeabilize the tissue sections by incubating them with Triton X-100. - Metanol/ H2O2 blocking used to block the endogenous peroxidases, which gives false staining when HRP conjugated secondary is used. Have you done the blocking with Normal serum or BSA. - What dilution of primaries were used in each experiment? - What is the catalogue number of DAKO envision secondary antibody use? Did you use same kit for all the antibodies? What were the other secondary antibodies used? - Have you used this detection system successfully before? - Did you tired optimizing the antigen retrieval method? Please note more information you will provide-resolution will be achieved quickly. Latest vial of the VEGF2R antibody is giving results inconsistent with results from previous vial; concerned that thedatasheet is missingearlier western blot data. As requested, I have issued a free of charge replacement with the order number 1076421 for the VEGF antibody ab46154.